If you had to ask me what my favourite designer brand would be - believe it or not I wouldn't pick Chanel it would be Missoni. This might sound random, but I LOVE how happy and bright their clothing and accessories are - regardless of how boring your outfit may be a bit of Missoni makes everything better. Seriously though how happy would your feet be if they were wearing a pair of these ballet pumps?? 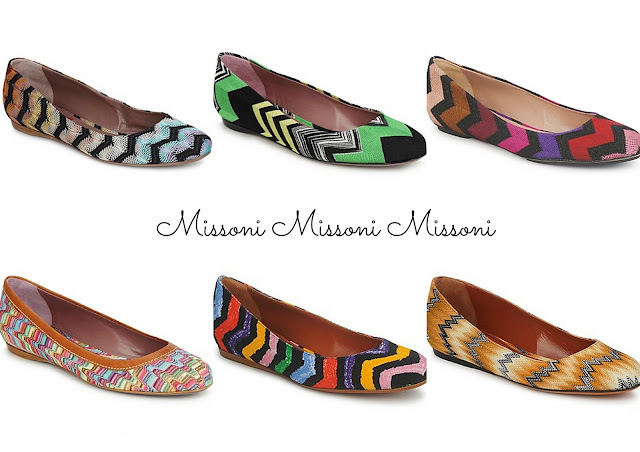 Personally I think you can always tell when someone is wearing Missoni purely by the designs and you aren't going to miss these shoes in a crowded room. Does it sound sad that I really really want a Missoni bikini however I still can't come to part with the cash to buy one. I definately think I need to win the lottery so I can buy all of the above... a girl can never have too many pairs of shoes. I've loved Missoni flats for ages, they're so cute! I can't find any decent dupes or anything similar anyhere...cause at like £350 a pop i'm never gonna be able to justify these bad boys...unless i win the Euros. Oh no.. I literally want every single pair of these!